(New Braunfels, TX – May 17, 2018) – Due to lack of needed rainfall, rising temperatures, and increased water usage, the Edwards Aquifer has dropped below the trigger level of 660 feet, to 659.5 feet resulting in a return to Stage 1 drought restrictions for New Braunfels. The restrictions will go in effect May 18, 2018. New Braunfels can also enter Stage 1 when the rate of the Comal Springs is at or below 225 cfs for a 24-hour period. The springflow was 267 cfs on Wednesday, May 16. As for other parts of the region, the Edwards Aquifer Authority declares Stage 1 for permit holders of the San Antonio Pool when the 10 day average of the rate of springflow at either the Comal Springs drops below 225 cfs, the San Marcos springs drops below 96 cfs, or the reading at the J-17 well drops below 660 ft. mean sea level. “The 10-day average for the J-17 well was 660.9 ft. on Thursday, May 17, so the entire region is also approaching Stage 1,” adds Taylor. Because of the large impact that reductions in landscape watering can have for maintaining the spring levels and critical habitat for our endangered and threatened species, the decision to declare Stage 1 when the J-17 actually reached or went below 660 ft. was incorporated in the New Braunfels Conservation and Drought Management Plan several years ago. About 12,500 acre feet of NBU’s water supply (approximately 40 percent) are subject to mandated reductions in use from regulating agencies when specific trigger levels are reached. Fortunately, NBU has a robust and diverse water supply that enables these mandates to be met simply through reductions in non-essential use of water. Watering with a hand-held hose, bucket, soaker hose, or a drip irrigation system is allowed any time on any day during Stage 1. The ordinance also prohibits outdoor fountains and waterfalls, requires a variance confirmation from the NBU Environmental Affairs for watering new landscaping, and limits vehicle washing at home to watering days and times over a pervious surface. The latest watering information can be accessed 24-hours a day by visiting www.nbutexas.com or calling the NBU Water Hotline at 830.608.8925. 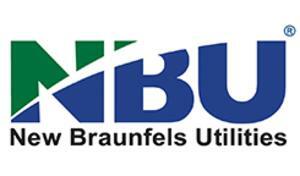 New Braunfels water usage guides are available at the NBU Main Office as well as the NBU web site under the Conservation tab.